Finally. The Perfect Vanilla Cake Recipe. I have a little confession to make: when I first started making cakes, my secret go-to for far too long was the box vanilla cake mix by Betty Crocker. Since I became accustomed to the light and fluffy texture of said box mix, every time I tried to make a vanilla cake from scratch, the result seemed off. Blame it on the lack of Propylene Glycol Mono (or the handful of other ingredients in box mixes that you’ve never heard of), but my from-scratch vanilla cakes always ended up too dense, tasted a little cornbread-ish, and just didn’t have that fluffy appeal. Finding a go-to vanilla cake recipe from scratch felt like a mountain I had to climb, but after (what felt like) five hundred tries and a whole lot of not giving up, I’ve found a recipe that is beyond my wildest cake dreams. This vanilla cake is light and airy, so easy to whip up, and tastes like a dream. The secret to it’s perfect texture is the cake flour, which produces a much softer, fluffier cake than all-purpose because of it’s lower protein content (the more protein in your flour the stiffer the dough and less ability to maintain moisture). 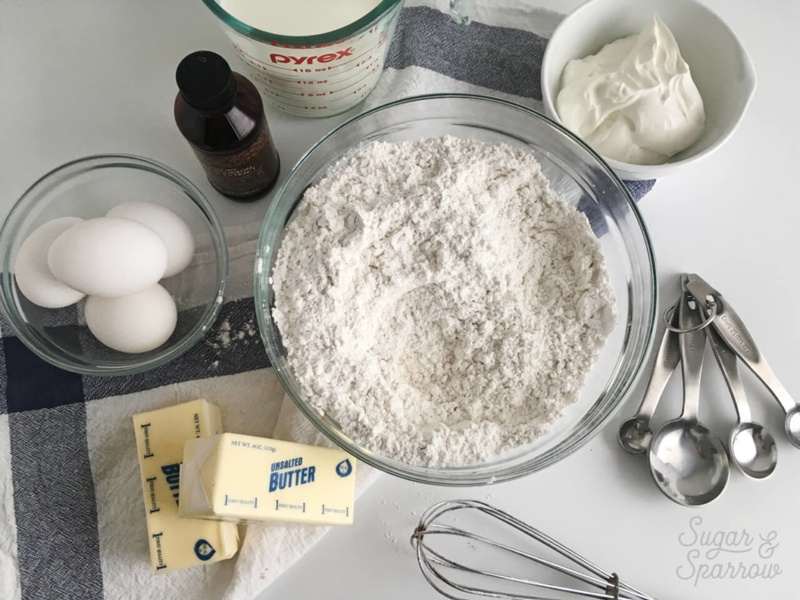 You can find cake flour at most grocery stores, but if all you’ve got is all-purpose flour in your pantry I’ve included a note on how to make your own cake flour in a pinch. To make this cake even more moist I’ve added a little sour cream and whole eggs for good measure. There’s also an entire tablespoon of vanilla extract in there to really up the flavor, because yum. 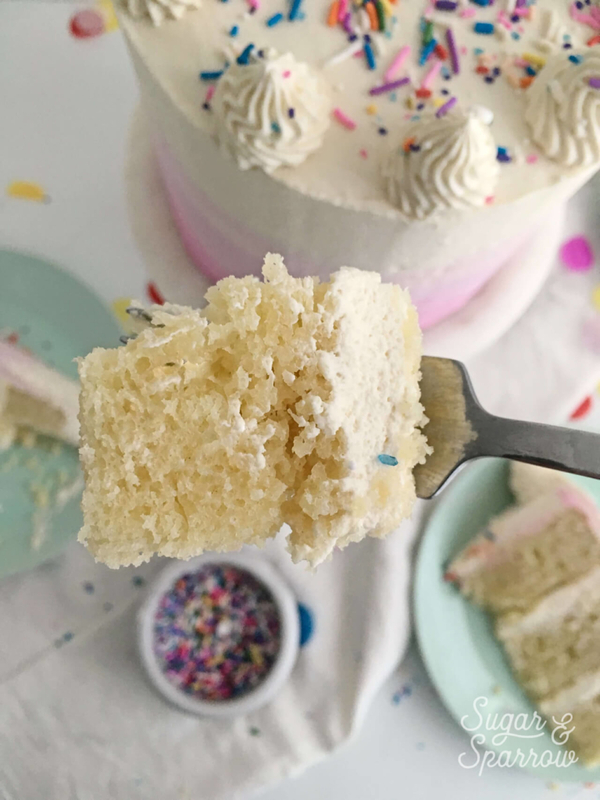 It pairs well with so many buttercream flavors, but if you want to keep things on the vanilla spectrum, try pairing it with this Vanilla Buttercream Recipe. It does not disappoint! I always do triple or quadruple 6-inch layers when making cakes (I like ‘em tall!) so if that’s the case with you, just double the recipe. If you’re more of a two-layer 8 or 9-inch cake maker, that’s exactly what this recipe will yield. An easy vanilla cake recipe that's light, fluffy, and flavorful. It's got the perfect texture you'll find from box cake mixes, without all the ingredients you can't pronounce. Preheat the oven to 350°F. Prepare two 8-inch cake pans by spraying the sides with a cooking spray (Baker's Joy is my favorite) and a wax paper circle fitted to the bottom of the pan. Alternatively, you can grease and lightly flour the pans. Sift the cake flour and then measure by spooning and leveling it in your measuring cup. Add the cake flour, baking powder, baking soda, and salt into a bowl and whisk to combine. Set aside. In the bowl of your stand mixer (a handheld mixer works fine too! ), cream the butter for on high for two minutes until it's light and fluffy. Add in sugar and continue to mix on high for another two minutes, scraping down the bowl and paddle as needed. Add the eggs one at a time, mixing thoroughly after each addition. Add vanilla and sour cream and mix for one minute on high, scraping down the bowl and paddle once more. With the mixer on low speed, add in the dry ingredients and mix until just combined. Add the milk slowly and mix until just incorporated. Scrape down the sides and bottom of the bowl and give it a few stirs to make sure there are no lumps (without over-mixing). The batter will be slightly thick, but pourable. Pour batter evenly into prepared cake pans (about 2/3 of the way full) and bake for 30-35 minutes. They're done when they spring back to the touch and a toothpick inserted into the middle comes out clean. Let the cakes cool in the pan for five minutes before turning them out onto a wire rack for an additional few hours of cooling. Make sure they're entirely room temperature before applying any frosting. 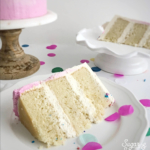 *DIY Cake Flour Recipe: To make your own cake flour, spoon and level one cup of all-purpose flour and remove 2 Tbsp. Add 2 Tbsp of cornstarch. Repeat per the amount of cake flour you need, then sift the flour and cornstarch mixture 4 times (don't skip that step!). After sifting, spoon and level to re-measure the amount of cake flour you need. 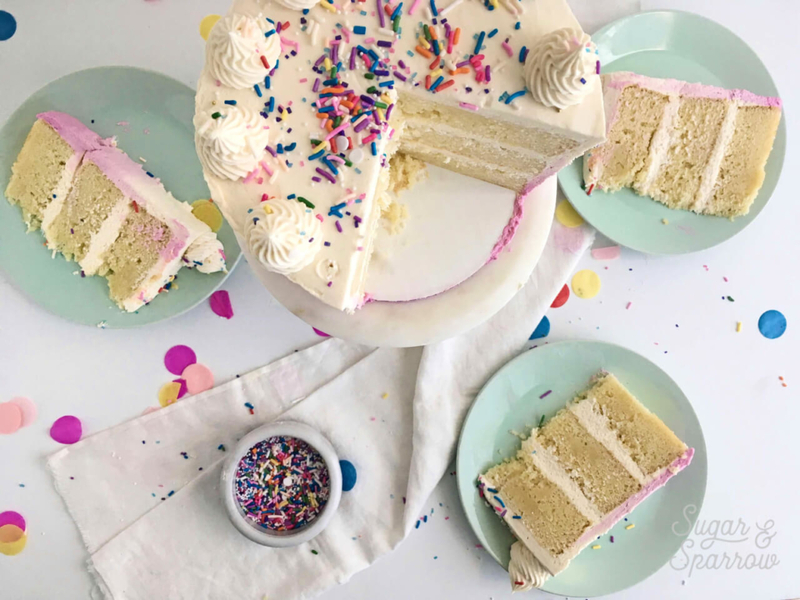 Make ahead tip: These cakes can be baked, cooled, wrapped in plastic wrap, and left out at room temperature up to two days ahead of decorating. Unfrosted cake layers can be wrapped tightly in plastic wrap and stored in the freezer for up to two months before thawing and frosting. Your tips and tricks are the best! It’s like you know the questions I would ask before I ask them! You have the gift of teaching and a huge talent for creating! Thank you so much for the kind words, Megan! I’m so happy to be able to share all of this with you! I like your Blog!!!! I am from Berlin. Please, how big (ml) is one cup? Wir have another cups in Europa. Hi Elena! Thanks so much for the kind words about my blog and I’m so happy you’re inspired! I just looked up the conversion from cups to ml online and it appears that 1 cup = 236.6ml. Hope that helps! This recipe is so yummy and!! 1.5x this recipe makes a 6 inch diameter, 5 inch tall cake. 2x this recipe would make a 8 inch diameter, 5 inch tall cake. And 3x the recipe makes a 12 inch diameter, 5 inch tall cake. Three tiers in those dimensions would serve 100-115. That would mean 7x the recipe total. Phew. Yes! Feel free to email me if you have any questions throughout. And happy birthday!! I made this today and it came out soooo well (despite me forgetting to add the milk into the cake mixture!!) – the cake is moist and delicious, you can really taste the vanilla, it’s lovely and solid and has smooth outsides perfect for decorating. Thank you so much!!! Yay Lia!! I am so happy to hear that you loved the recipe 🙂 Can’t wait to see how you decorate! I live in Spain and we don’t have sour cream. What do you recommend I can substitute the sour cream with? Thank you for the recipe, Whitney! I’m from Brazil! I’ve never bake a cake like this and I’d like to start with a 4 inch on. How many layers of cake should I use? If do you use 4 layers with 4 inch each this recipe have a perfect size right? Hi Lana! For four inch cakes, I typically use three layers but have used four layers for taller designs. It’s totally up to you! When using a 4 inch pan, this recipe yields 8 layers of cake, so you could easily choose the perfect amount of layers after they’re baked. Hello Whitney! I just wanted to ask a question based upon I use springform cake pans and I was wondering how could I adjust this recipe to create two 10” cake, which I will cut into 2 which will become a 4 layer cake? Hi Nagina! I have never made this cake in a taller cake pan (mine have 2 inch sides), so I am not sure how the baking times will be affected. I would definitely triple the recipe to accommodate that amount of cake batter, but you’ll need to bake them for longer than the recipe specifies since there will be more volume of cake batter in the oven. How long do you usually bake cakes of that size? I would set the timer for however long you’re used to with those pans and keep an eye on the cakes to make sure they don’t cook for too little or too long. I must admit I did make 2 changes, I used buttermilk instead and added an extra tbsp of vanilla. Everyone LOVED it! Thank you once again for sharing this amazing recipe! Hi Jasmine! I’m SO happy to hear that this was a hit!! Glad you loved the recipe and consider it a great one. I’ll have to try it with the buttermilk and extra vanilla! Thanks for letting me know! I love the sound of this recipe. My twins have asked for a unicorn cake (one each) for their birthday. It has a fondant unicorn head on the front. As I’m making 2 cakes I want to make two quite small ones (to prevent waste) with a bit of height to accommodate the unicorn head, so multiple layers will be required. Any help on how to adapt this recipe would be very much appreciated (tins cooking times etc). The smallest tins I have are quite high sided 6inch tins but I could buy 5 inch. Many thanks. Nicola. Hi Nicola! This cake recipe works well with smaller sized pans. Although I’ve successfully made it with 4 inch pans, 6 inch pans, and as cupcakes, I’ve never tried it with a taller sided cake pan, so I have no idea what the baking time would be. For the 6 inch pans (2 inch tall sides), I baked for 40 minutes. I would be sure to fill the pan no more than 2/3 full and check it at 40-50 minutes to see if it needs more time for the taller sides. The reason the 8 inch pans need less baking time is because the layers aren’t as tall as my 6 inch pan. times. Will let you know how I go! Oh perfect! For some reason I read that as you having a pan with 6 inch tall sides 🙂 For a 6 inch cake with 3 inch sides, just check it at 40 min and gauge whether or not you need more time. My estimate would be about 50 min total, but let me know how it goes! Another great one, thank you! I too have been looking everywhere for a good light and fluffy vanilla cake and this fits the bill. This is the third this month from your blog and all have been fantastic. The cake sank slightly while cooking but after leveling it off it turned out great, I might of opened the oven to check at the wrong time or maybe because I used 6″ silicone pans, I never know why it sometimes sinks. I did your buttercream but added a little passionfruit concentrate for flavor and was awesome. Hi Chad! I’m so happy that these recipes are working well for you! The addition of passionfruit to the buttercream sounds heavenly. I’m gonna have to try that! And about the sinking – I’ve never tried silicone baking pans so that could be it, but also opening the oven door before the batter is set can cause a cake to sink slightly. Not entirely sure what happened but I’m glad it was perfect when you leveled it! Looks divine! I will try this recipe next as the last recipe I tried turned out way too dense . Would it be okay to substitute the butter with vegetable oil? Or even half butter, half oil? If will it be the same measurements? Also would this recipe work well with cake strips? Thank you! Hi Roxane! I haven’t tried this recipe substituting the butter with vegetable oil before, so I can’t recommend it. This recipe is really light, fluffy, and flavorful as-is. And yes, you can totally use bake strips with this cake recipe. I hope you love it! Omgosh! I have made vanilla cakes and they all taste like cornbread:( Im so excited to make this!!!!!!! But, can i use ap flor instead of cake flour? Would therr be any difference? Hi Iris! I can’t wait for you to try this recipe! 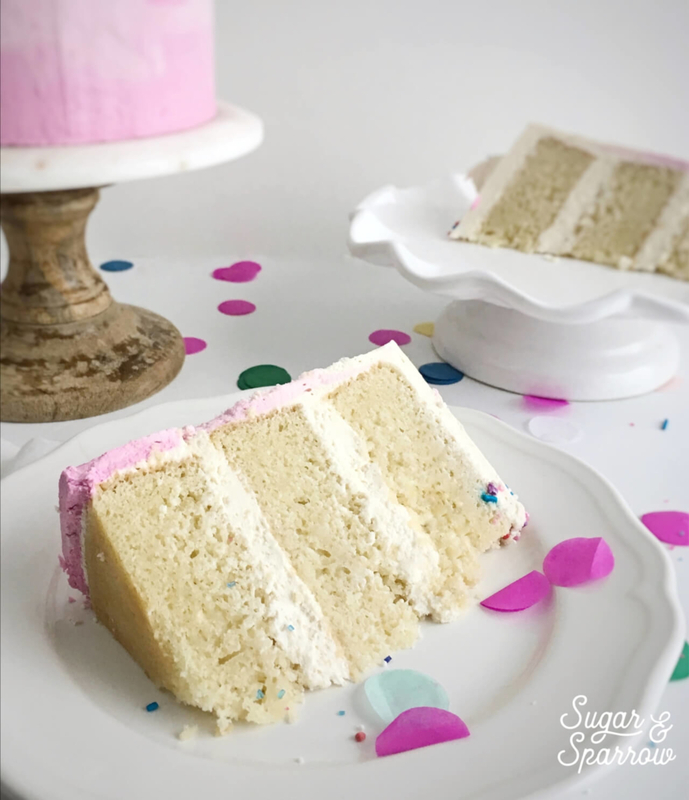 The reason it calls for cake flour is because that’s what makes it soft and fluffy – all purpose flour tends to make vanilla cake dense and cornbread-y in my experience, so I wouldn’t recommend substituting the cake flour with all purpose. You can make your own cake flour in a pinch if you can’t find it at your grocery store. The recipe is in the notes section of the recipe. Can i substitute sour cream with yogurt? Hi Dora! I have never tried the recipe with yogurt as a sour cream substitute, but I think as long as you go with a full fat yogurt you should be alright. The purpose of the sour cream is to add extra moisture, and only a full fat substitute will do that. Hi, do you have any recommendations for baking this at altitude? Hi Whitney! It’s Jasmine again‍♀️. I hope all is well with you! I wanted to ask if by any chance you know how many cups of batter the recipe makes? I am making cake pops 2 different ways (in the cake pop maker and old fashion mush and squish ) and cupcakes but it is a very small quantity that I need. I was thinking of making one batch of batter and splitting it between all 3 treats. Also, do these bake relatively flat? Hi Jillian! For a two tier cake of that size, I would triple the recipe. That’ll give you a little bit extra batter, but it’s better to have a little more than you need than a little less. These cakes do bake relatively flat, but I always use a cake leveler after baking them to make sure each layer is perfectly even. Hope that helps! I just made this cake and i’m quite pleased with it! The layers baked up perfectly, its got good flavor without being TOO sweet. It is a smidge on the dense side, but i really think i should have baked it a few minutes longer, which probably would have helped. I’ll try that the next time. Overall, i think i may have found my new go-to recipe. Also, this post is how i found sugar&sparrow, i’m enjoying exploring. Hi, I’m Vicky and new to baking. 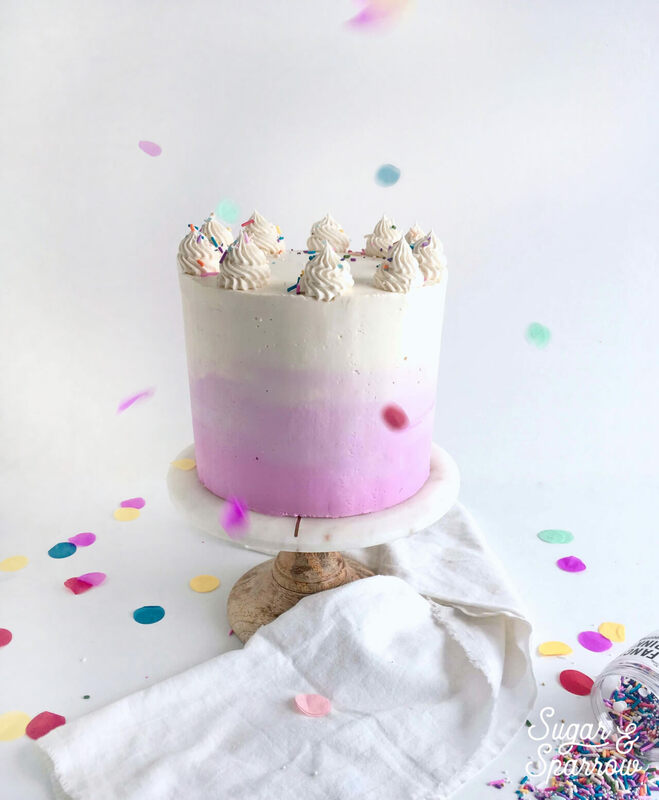 I’m eager to make this cake for my lil girl’s 3rd birthday…but I’d like the cake to be 8inches wide and stacked up three levels with butter cream in between. I read from the comments that I may have to double all my ingredients. Will I have to double the creaming time too? Say from 2 mins to 4 mins? And will I have to double the recipe for the butter cream too? You will have to double the amount of buttercream to fill and frost a cake, unless it’s part of a recipe that specifies that it’s meant to fill and frost a cake of that size. Hope that helps! Thanks, Whitney! The vanilla cake recipe turned out great! So happy to hear that, Vicky!! Hey Whitney! I was super excited to try this receipe (and the batter was delicious!) but things didn’t go as planned. About 20 min into baking the pans completely overflowed. I used two 9×1.5 in cake pans. Do I need taller? My oven is also pretty old, so perhaps that factored into the issue. Any idea where I might’ve gone wrong? I’d like to try it again! Hi Hannah! So sorry to hear that your cake pans overflowed! The pans I use are a little over 2 inches deep, I’m sure the shorter pan has something to do with it. I would recommend only filling a pan of that depth 1/2 full instead of 2/3 full. Let me know how it goes next time and I hope these ones can be salvaged!